Mark Carney, Chairman of the Bank of England. Photo courtesy of the BoE Flickr account. 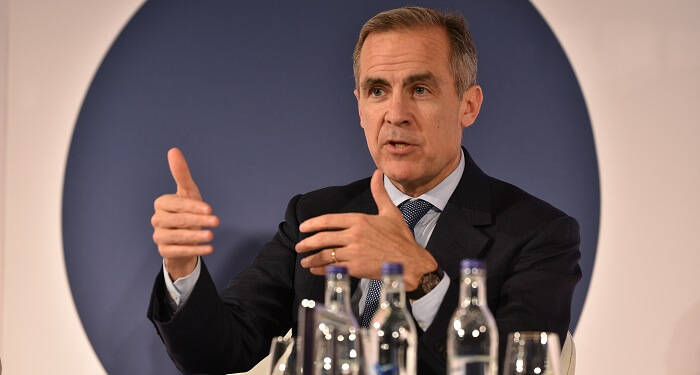 Mark Carney, Chairman of the Bank of England, gave a press conference at midday today to report no new interest rate rise and a reduced growth outlook of 1.2% for the year – down from the 1.7% expected last year. “The fog of Brexit is causing short term volatility in the economic data, and more fundamentally, it is creating a series of tensions in the economy, tensions for business” said Carney. “Although many companies are stepping up their contingency planning, the economy as a whole is still not yet prepared for a no-deal, no transition exit. The Bank of England’s research threw up one key chart (see above) which shows how far from previous expectations the UK economy’s performance is. The US/China trade war has been an unexpected hinderance, but Brexit’s toll before withdrawing has been far greater than predicted. The Bank’s report goes on to highlight the first half of the year as the slowest point of growth for the economy, with the expectation of little to no growth at all. The data shows that the UK’s Gross Domestic Product (GDP) is 1.5% below where it was forecast to be by the Bank in 2016. The chairman’s approach is much less confident compared to earlier last month, when Mr Carney said he believed that No Brexit was more likely than a No Deal scenario. Following the revelation that the Bank of England fears a recession, the Pound Sterling sharply fell against the US Dollar – down at its lowest since early January this year. The Bank of England’s official stance is that future interest rate rises will depend on the degree of Brexit that the UK experiences, and the subsequent trading agreements that can be established. Carney did extol the fundamentals of the UK economy, however, citing the resilience of the financial sector and the fact that the labour market is tight and benefitting from strong employment levels. This claim seems to be backed by the latest European Commission forecast (see below), which puts the UK’s growth for 2019 fractionally higher than that forecast by the BoE at 1.3% - equal with France, Belgium and Sweden. Only Germany (1.1%, down from 1.8%) and Italy (0.2% and in recession) are lower forecasts. In line with the recent poor manufacturing figures, UK house prices were revealed to have fallen by 2.9% in January compared with December. The Halifax reported that house prices were down in the first month for the second time in three years, but that prices were up overall – slightly – by 0.8%. This may tie in to today’s other news that new house building is down by around 10% in London and both sides of the Midlands. One small positive is that the current low interest rates offer cheaper mortgage rates, but with growing economic instability and concerns of recession, it’s unlikely that house buying will do anything but slowdown in 2019.